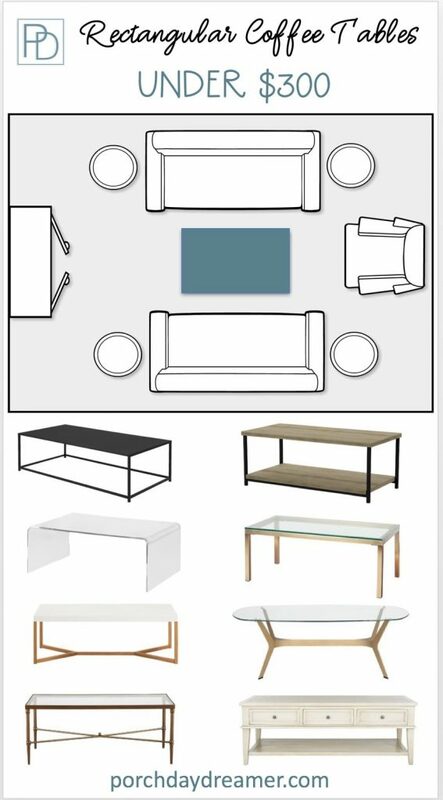 Are you struggling with what shape coffee table to choose for your space? 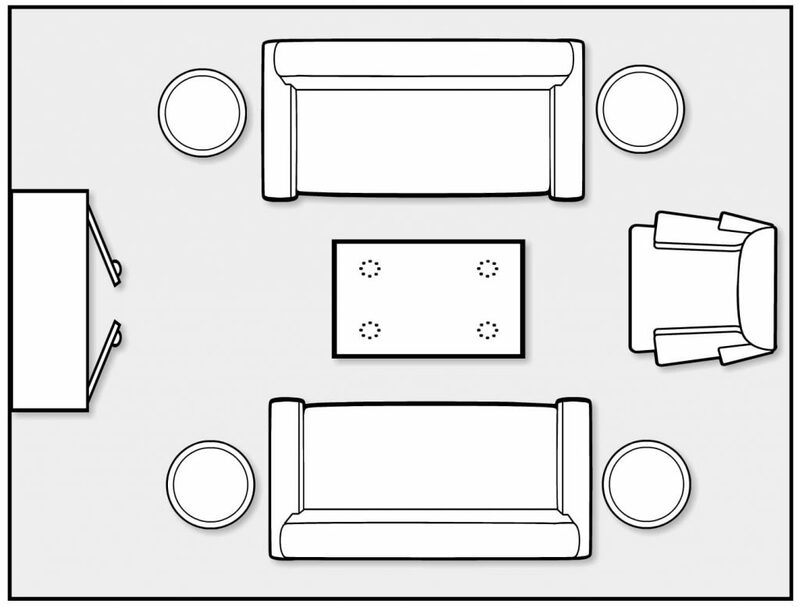 Understand when a round, square or rectangular table may be best for your furniture layout. 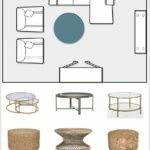 Finding a coffee table for my recent family room update took months! Do you have a hard time narrowing down the wide variety of choices? Coffee tables come in so many shapes and finishes it’s hard to know what to choose. 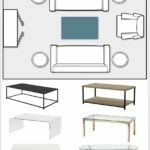 Here I’ll teach you the basics for how to select the perfect shaped coffee table and decide if round, square, or rectangular is right for your room. Plus do it on a $300 or under budget! Have fun shopping for your new coffee table. Side note: upholstered coffee tables in fabric or leather look amazing but aren’t the most practical since they are hard to clean. You also have to use a tray for drinks, so they are limited in their use. Knowing I wanted a lighter look in my family room, I went for a white top that was lacquered. My previous coffee table had a wood top that took a beating. We use our coffee table to eat on as well, so a more durable top was important. The white top completely changed the space and I can spray it down to clean – perfect! Then you need to look at the finish of the table. I loved the antique gold and how it worked with not only the wood tones, but also the gold frames I had throughout the room. There are so many options, so you need to narrow down your choice but deciding what look you want to achieve. 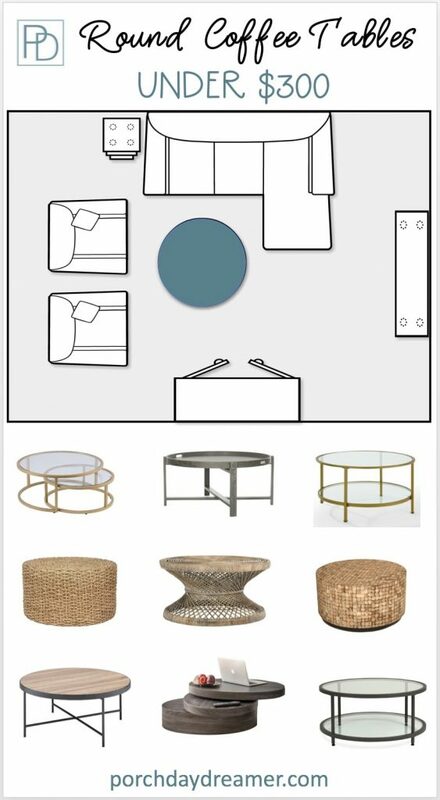 Do you want the coffee table to match the existing finishes in the room (like I did) or do you want it to be a statement piece that anchors the room? 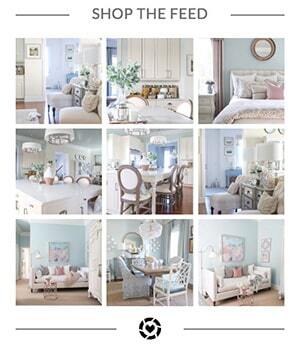 Last, but not least you will need to think about your living space and the shape of the coffee table you need. 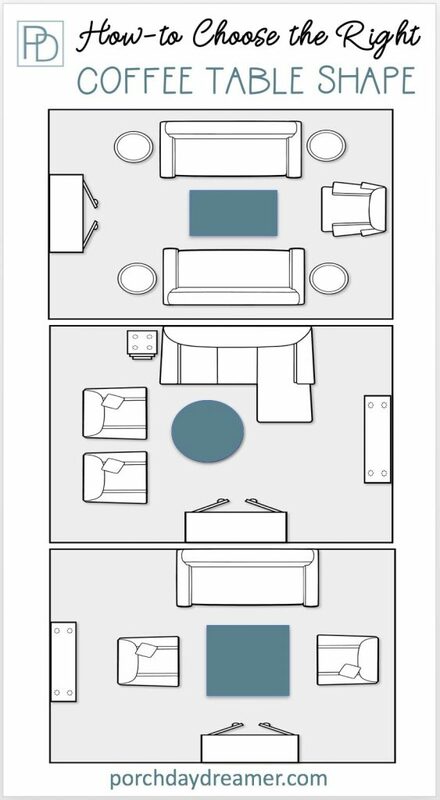 For reference, here is my family room layout. It’s an odd shape and I have to contend with a corner fireplace sitting in the lower right corner of the room. 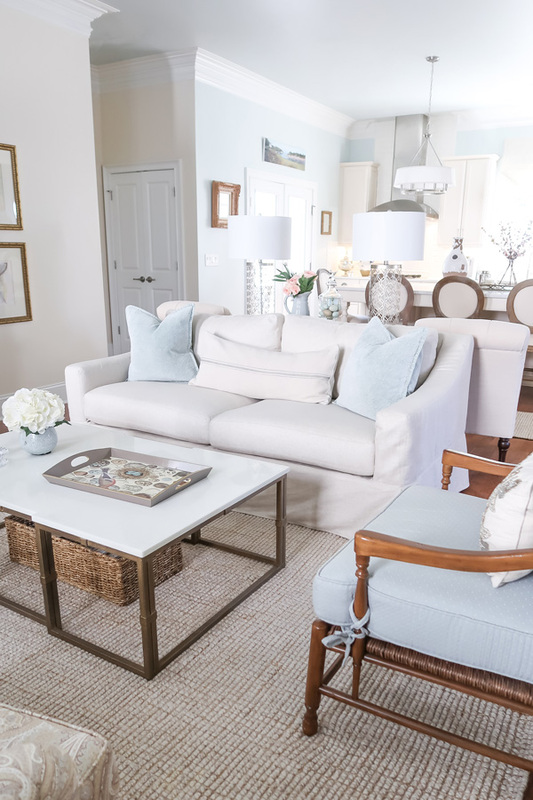 In the family room, a rectangular coffee table filled out the space perfectly. Everyone in the room can easily reach the table and set down a drink. Even in a small space I’ve maximized seating and went for a larger coffee table that was 52 inches by 32 inches. 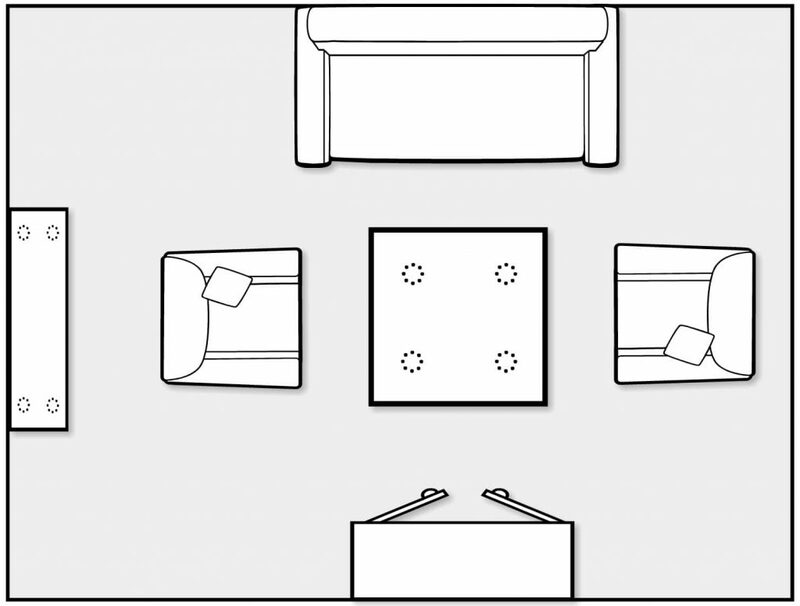 Let’s look at some furniture layouts to show you how furniture can be arranged with the various shapes of coffee tables. 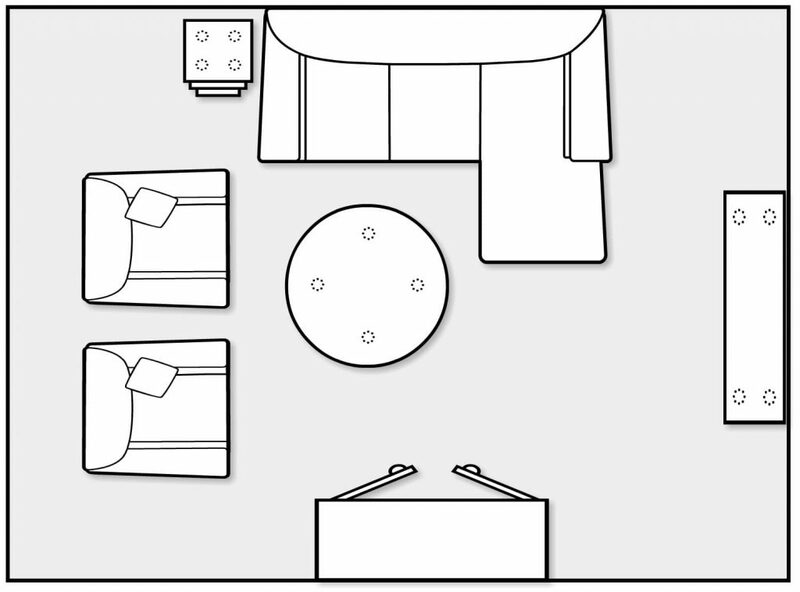 My main reason in showing you these layouts is to show you scale and the distance between furniture. Having a rectangular table that is a little larger is perfect for this furniture layout with sofas directly across from each other and a chair at the end. Many people have sectional sofas and get confused by what shape table will look best. Since you are tucking into the L shape, both a round or square table fit the space nicely. If the “sofa” part of the sectional has 3 cushions and is longer, then an oversized rectangular coffee table may be best. In this layout, both the sofa and chairs are really deep at 44 inches. When a room is on the larger side and so is the furniture, an oversized square coffee table looks amazing. When looking for a coffee table, make sure to write down the measurements and map it out in your room. I typically do this with two tape measures laid together, but you can also layout the measurements with painters tape or wrapping paper. Then you can see if you have enough or too little space between the furniture and the coffee table. Choose a coffee table that fits with the scale of the room and furniture leaving enough space to walk between the furniture. 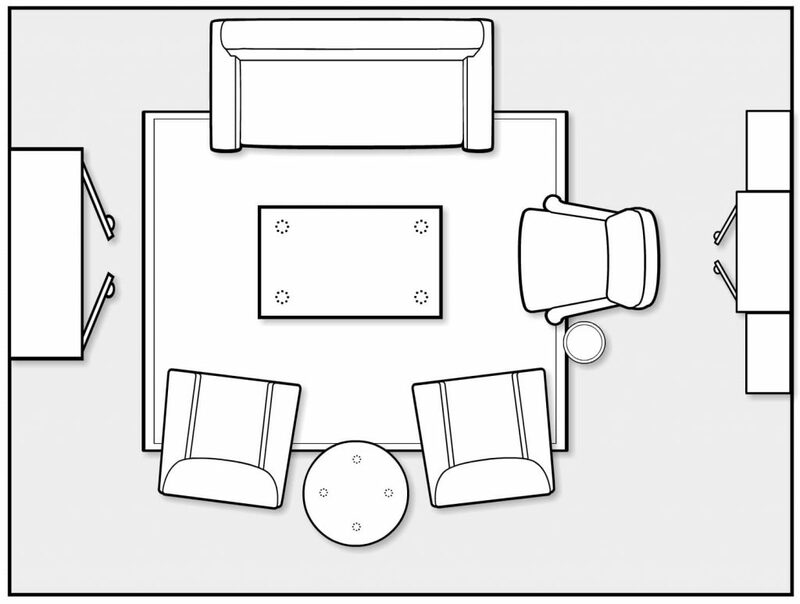 Don’t push all of your furniture against the walls, but instead pull pieces together leaving about 1.5ft between the table and seating pieces. Is this all starting to make sense now? Hopefully the answer is yes! 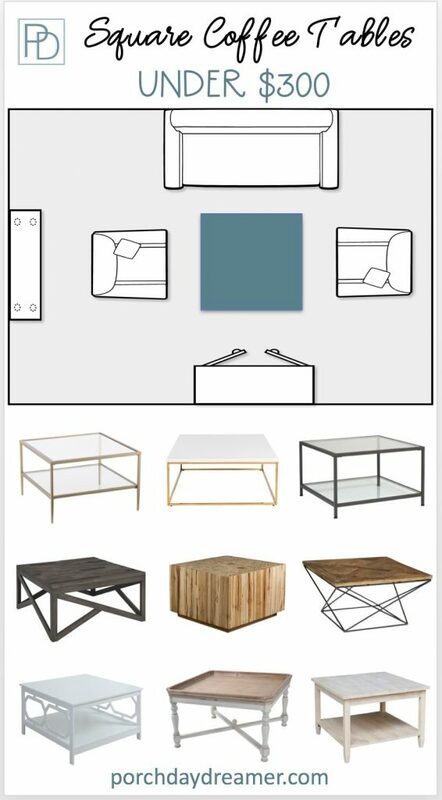 Now that you now how to choose a coffee table that will look like a designer found it for you it’s time to go shopping! 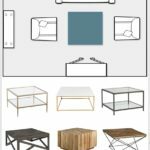 I’ll group the coffee tables by shape to make this as easy as possible with a variety of styles from modern, transitional, and traditional design. Plus a variety of finishes so you can find something that works in your existing space. What do you think of all of these choices? Isn’t it amazing what gorgeous design can be purchased for under $300 and sometimes half of that? Good luck in your decorating adventures and I hope you find something you love! 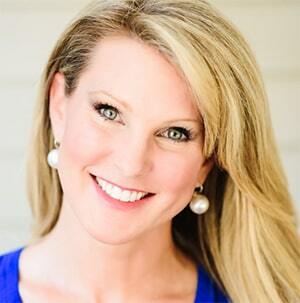 My Secret Source for Affordable Outdoor Furniture! Please consider signing up for my weekly email newsletter, so you never miss a post, tip, or tutorial! Hey, T! Awww, thank you I appreciate it!